Beautiful LONG CANYON home in Wood Ranch! Tremendous curb appeal, making you excited to see what’s inside! With over 3100 SF, his home is well-maintained and shows like a model. 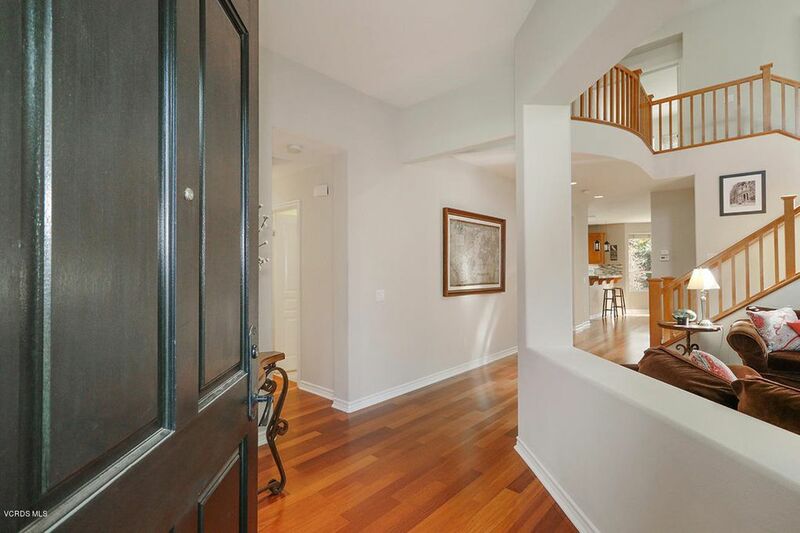 Rich hardwood flooring and high ceilings, allow for plenty of natural light. Downstairs office/bedroom, with full en suite bath, complete with custom black and white tile flooring. Quietly located away from living space. Formal dining with access to side courtyard. Kitchen, with updated tile and backsplash, granite countertops, stainless appliances, including double oven and Viking range, and center island. Kitchen opens to family room, showcasing contemporary fireplace with colored glass. Countertops allow for seating, along with eat-in kitchen. Sliding door leads from kitchen to yard, opening up the space beautifully for entertaining. Master bedroom with en suite bath, complete with custom tile, and walk-in closets. Three additional bedrooms; two feature jack and jill bath, and the other, with en suite bathroom. Laundry room conveniently located upstairs. Garage includes floor-to-ceiling custom storage racks, along with celling-mounted racks. Community offers 4 pools, spas. Long Canyon living at its best! Amazing 3 car garage!